It is the time of the year again for me to embarrass myself. It is much harder to make a prediction this year than the last. Jaedong’s performance this year has been lackluster. Some may argue that there are more deserving players for that spot, and I can understand why. He barely made it in being the #16 player. On the other hand, Bomber goes into this tournament with the best form of his life by winning the Redbull Battleground and WCS America Season 3. However, TvZ is never Bomber’s strongest match up, but his unique style has definitely destroyed many Zergs before. StarDust can beat any player on any day. But given that MMA’s form recently is so good, I see MMA advancing. If herO does not play another Protoss, I believe that he has a good chance of winning it. However, since his first opponent is the BossToss, things get complicated. MC’s PvP is definitely not weak, but I favor herO here because he has the KeSPA Protoss aura (practice partner advantage). There are very very few Protoss who can beat Polt in a best of 5. Is Classic one of them? No. At least not now. Classic definitely has much to prove after his Sniper-esque GSL victory. But I doubt sheer will is enough to overcome Captain America. Probably the least celebrated match in round of 16, and understandably so. Neither player has a great story line or a fan favorite. Although it may seem disrespectful, but both of them may get eliminated in the first round if they are facing other players in the tournament. I will give it 40-40. As TaeJa said, San is one-top. So there you go. Zest is coming into this tournament as the favorite by winning GSL, KeSPA cup and GSL Global Championship. Oh, if that’s not impressive enough, throw in Proleague and IEM (second). But his opponent is a tricky one, the most unique Zerg in the world. I won’t be shocked if Life takes it, but I will put my money on Zest. Arguably the most anticipated match of this round. The player with the most second place finish versus the player with the most first place finish. soO is invincible because this is not the final. But it is extremely hard to bet against TaeJa at the same time. I will say soO, simply because… I don’t know… Because soO’s favorite color is yellow, and not blue. There you go, logic. On paper, it seems like INnoVation should be the winner, but his opponent is HyuN. HyuN, the commander of the Roaches. There is no secret that INnoVation’s weakness in TvZ is early all-in with Roach and Banelings. Moreover, INnoVation is not as comfortable against Roach-Hydra as he’s against Ling-Bane-Muta. Nevertheless, INnoVation should still come out on top as a better player overall. Bomber is the best TvT player now. Period. But MMA is a TvT monster himself. These two were the best Terran players back in the GomTvT days. Tough choice, but Bomber never disappoints, right? Right?! Like I’ve said, there are very few Protoss who can beat Polt, and herO is definitely one of the them. herO is arguably the best PvT player out there. If you don’t believe me, go check out his match history yourself. With that being said, Polt’s TvP record is equally impressive. This is going to be a treat. I will give herO a slight edge because of the predictability of Polt. Although Zest just lost to Sora 3-0, his PvP is still one of the best in the world. In contrast, San is mediocre in PvP. I will be shocked if Zest loses. GSL Final rematch. Let’s play a drinking game: drink when the caster says Roach-Baneling all-in. It is 50-50 in my opinion. But this is not the final. Bomber’s TvP is not bad, but it’s just not as good as herO’s PvT. Zest wins herO in PvP. Sounds normal. I just have a bit of fun with the prediction. so don’t be too serious in making an argument that who should have won instead. Let me know your prediction in the comment. Have fun coming back to post in the comment to laugh at me this weekend. I hope you realize that most of these players are subpar compared to avilo. Due to a few unlucky build order wins and games against maphackers at tournaments, avilo wasn’t able to reach BlizzCon. I’d say, hands down, that Blizzard is going to replace JaeDong with avilo. Whether or not avilo wins remains to be seen. Many of these players are maphackers and/or play protoss, so even avilo’s insane mechanics and gamesense might not be enough to claim victory. Flash vs. avilo in a mech mirror, who wins? To be honest, I’ve never watched his stream. I should give it a go, but I doubt I’m gonna last for more than 5 minutes. I actually like your most of predictions for the lower half of the bracket, but I think if Innovation can hold off Hyun’s Roach timings, then I think he can beat soO in the quarters and push through to the Semi’s. I still think Zest will stop him there, however. Zest is just on fire. For the upper bracket, I agree with your predictions of Bomber pushing to the semifinals over Jaedong and either MMA or StarDust. However, Polt’s TvP is just sick, and I am betting that he will take herO if for nothing else than to have another face-off against Bomber in a semi-final (which he will, sadly, probably lose by 1 game if recent showings in WCS AM and RB Battlegrounds is any indicator). My gut tells me Bomber vs Zest in the final, with Zest taking it 4-2. Sounds reasonable. 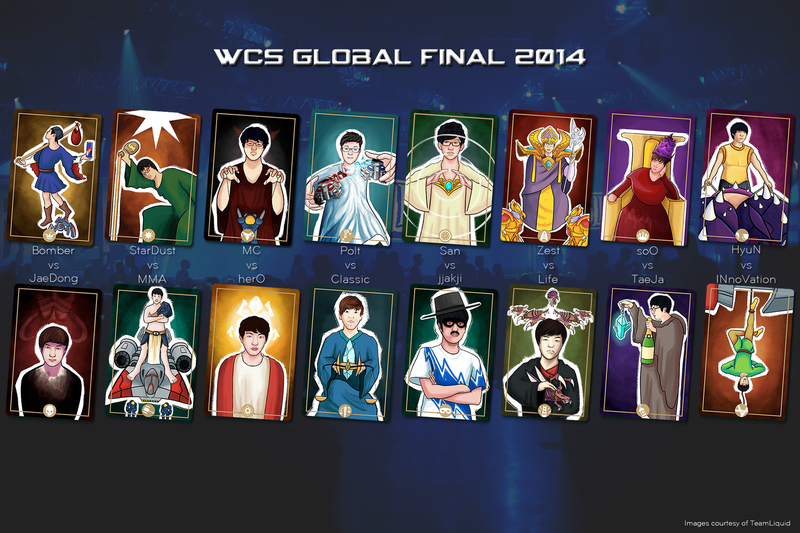 I want to see Terran in semi-final and the final. So I don’t mind Bomber or Polt goes to the semi together. What I would really like to see is for Taeja to beat soO and have a Taeja-Innovation rematch. Their game from the Season 2 finals in 2013 was insane. I rewatched it yesterday and it was just as thrilling as the first time. Deep down I’m rooting for Taeja. After all, this is his last tournament. seems like I was wrong. JaeDong didn’t get subbed out for avilo. also, nice predictions, 3 for 4 so far on round of 16. anyways, avilo is definitely going to be brought out for the grand finale, a 2 (innovation + bomber/herO tagteam) v 1 (avilo at 50% handicap). 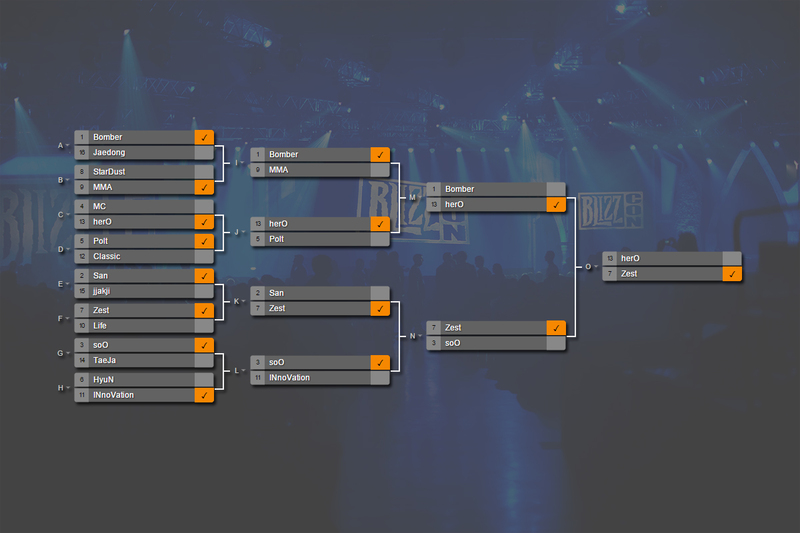 it’s tough to call, especially if herO n00btoss advances to finals, but I’d say avilo in a 4-2 victory. in hindsight, having avilo crush all opposition would’ve been a poor choice. i like blizzard’s choice of the 2v1 better. WHATWHATWHAT??? No Zest and no soO in ro8? I smell a TvT finals! Games were SO GOOD this weekend, but I am sad Polt lost. The soO vs. Taeja games were great and I guess there’s no surprise whoever won that. Zest vs. Life was close, but I guess everyone was expecting Zest to win.